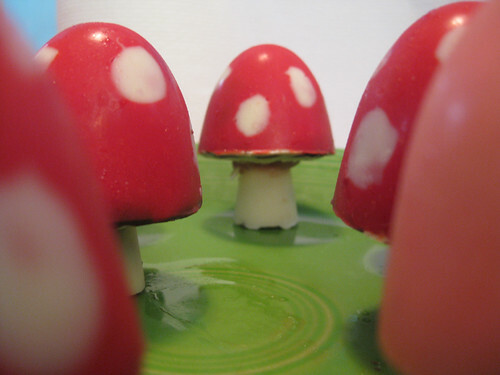 I finally dug out the molds and chocolate I had bought a while back to make these adorable chocolate mushrooms. Emily and I tried our hand at making them and here is our result! It was our very first time making molded candies, and I was surprised that they came out looking at decent as they did. We definitely learned a lot...the colored chocolate (white, red and pink) was brushed into the molds first, then a nice thick layer of dark chocolate was put in. We filled them with strawberry-laced buttercream I had leftover and then assembled them. Definitely not professional looking, but pretty cute. Unfortunately....they were unbearably sweet! None of us could get through more than about half of one and we have had no desire to repeat the experience. I think they'll be getting thrown out tonight. I might try them again, but fill them with something (relatively) lighter, like marshmallow fluff. But I think it'll be a while. 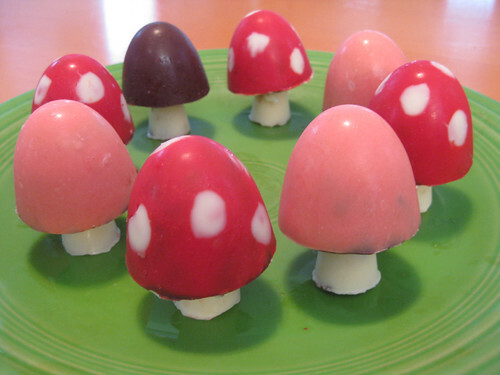 They were fun to make, though, and we'll definitely be trying more molded chocolate one of these days! Just.....not so big. And not full of frosting.